Danny, played by Johnny Newcomb, and Sandy (Kimberley Immanuel) are the leads in ‘Grease’ at Ivoryton Playhouse. Both are members of Equity. Photograph by Anne Hudson. 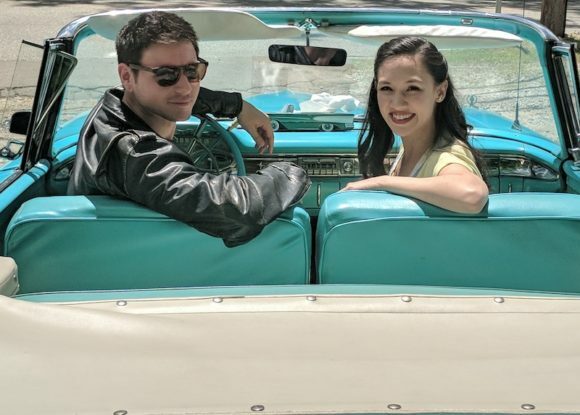 IVORYTON — Dust off your leather jackets, pull on your bobby-socks and take a trip to a simpler time as Danny and Sandy fall in love all over again at the Ivoryton Playhouse. Opening on July 5, and running through July 29, Grease, by Jim Jacobs and Warren Casey, features all the unforgettable songs from the hit movie including “You’re The One That I Want”, “Grease Is The Word”, “Summer Nights”, “Hopelessly Devoted To You”, “Greased Lightnin’” and many more. 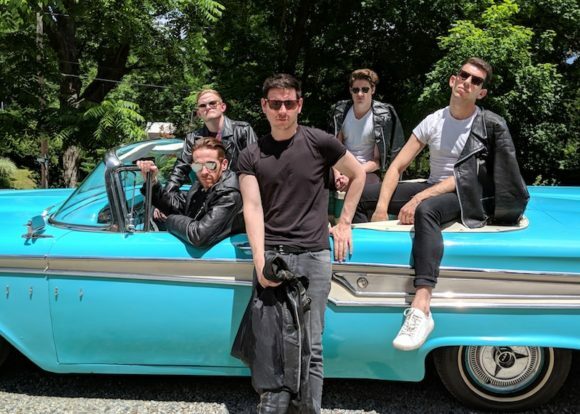 The Burger Palace Boys comprising (Kenickie, (Natale Pirrotta*), Roger (Taylor Morrow), Danny (Johnny Newcomb*), Doody (Luke Linsteadt*) and Sonny (Max Weinstein) play a key role in ‘Grease.’ * denotes member of Equity. Photograph by Anne Hudson. ‘Grease‘ opened Off-Broadway at the Eden Theatre on Feb. 14, 1972 but was deemed eligible for the 1972 Tony Awards, and received seven Tony Award nominations. The 1994 revival also garnered Tony nominations and the show went on to a successful national tour, featuring local hero Micky Dolenz as Vince Fontaine. The movie that we all know and love opened 40 years ago and it is a testament to the music and the iconic characters that ‘Grease‘ is still the word today. The best part of this quintessentially American high school story (aside from the music, of course) is what Danny, Sandy, Rizzo, Kenickie, Frenchy and the rest of the Rydell High gang taught us – that the people who really care about you will stay by your side no matter how different you are from one another, and support you just the same whether you’re a pom-pom-wielding goody-two-shoes, a leather-touting T-Bird or a starry-eyed, pink-haired aspiring beautician, who drops out of school months before graduation. The production is directed and choreographed by Todd L. Underwood and musical directed by Michael Morris, with set design by Daniel Nischan, lighting design by Marcus Abbott and costume design by Elizabeth Saylor Cippolina. Grease opens at the Ivoryton Playhouse on July 5 and runs through July 29, 2018. Performance times are Wednesday and Sunday matinees at 2pm.Evening performances are Wednesday and Thursday at 7:30pm, Friday and Saturday at 8pm. Additional matinee performances are on Saturday, July 7, 14 and 28 at 2pm.